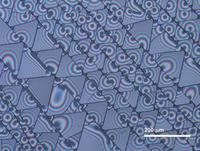 Shark teeth fracture pattern of a ~3 micron thick film formed by desiccation of silicone nanoparticles on a glass slide. Image was taken with a Nikon MA200 inverted microscope. Flux of self-interstitials and self-interstitial concentration near a symmetric tilt grain boundary in copper, calculated by object kinetic Monte Carlo simulations. 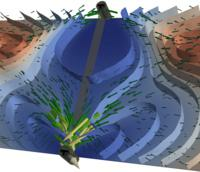 Stress fields due to the grain boundary are evaluated by anisotropic elasticity calculations. 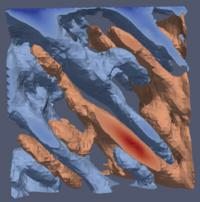 Dislocation density evolves in a composite structure. The blue and the red colored areas denote the edge parts of geometrically necessary dislocation density of opposite orientation. Due to the heterogeneity of the structure a strongly interleaved pattern evolves.